To quote a friend, "Everyone's cake is favourite chocolate cake." Recently, I was watching a children's television show called Bing with my daughter. Bing is a cute black bunny, and in the episode we were watching, Bing had found a balloon. He was playing with Balloon, and having lots of fun, when suddenly Balloon popped. Bing desperately asked for someone to "make Balloon big again," but he had to face the fact that Balloon was never coming back. To ease Bing's sadness, his friend Flop suggested putting Balloon in the "bye bye" box, where it would always be safe. And it was around about this time that I figured out what this cartoon was really all about. After Bing had put his balloon in the "bye bye" box, he drew a picture of Balloon on the top so he would always remember it and the happy times they shared. When Flop asked Bing what Balloon was doing, Bing said he was happy, and "floating up and up into the sky." I do not think I have ever seen a television show that treated children with such respect. It took concepts of death, loss, burial, denial, and even certain religious beliefs, and condensed them into a ten minute show that made such big, impossible subjects something that children could relate to in their own way. The creators of Bing have a talent: An ability to talk to children, not to talk down to them. It is an ability that I hugely admire, and which I often find lacking in the world of board games. All too often, you see companies churning out horrible roll and move board games that show an incredible lack of respect for their young target market. They just stick a much-loved cartoon character or book hero on the cover, and pass it off as a "must have" family game. But children are not stupid, and they should not be underestimated. They want to be entertained just as much as adults, and they deserve games that have been created with the kind of love and dedication that we demand ourselves. 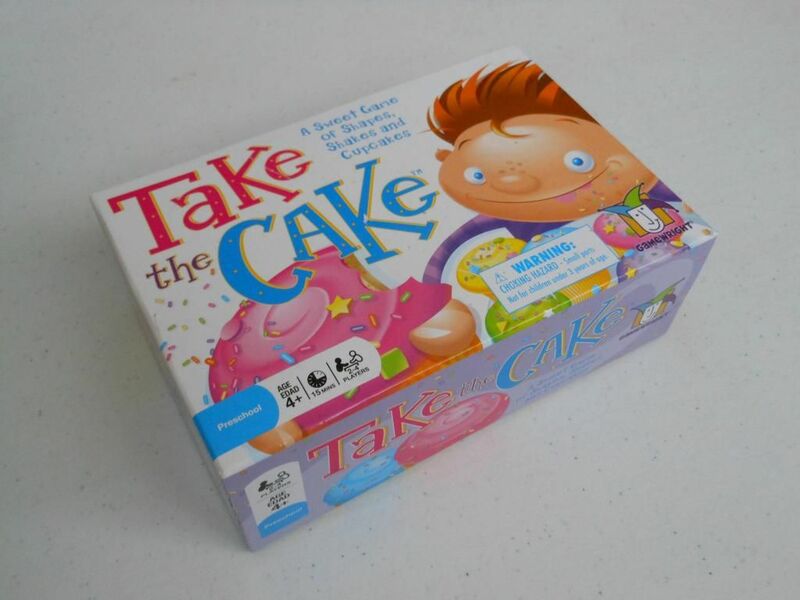 Which brings me to Take the Cake, a cute little filler game for children aged four and up. My daughter's godfather, who is one of my best friends and part of my regular gaming group, purchased Take the Cake for my daughter for Christmas in 2013. She was only three at the time, but she had absolutely no problem with the rules, and we have played countless times since she excitedly unwrapped it. Not a good game for adults. But a good game for children. It is a game that is colourful, tactile, engaging, fun, and educational. It combines everything you would hope to see in a children's game. And yet the game is about as simple as games get. Players are aiming to decorate a series of cupcakes, each represented by a card. 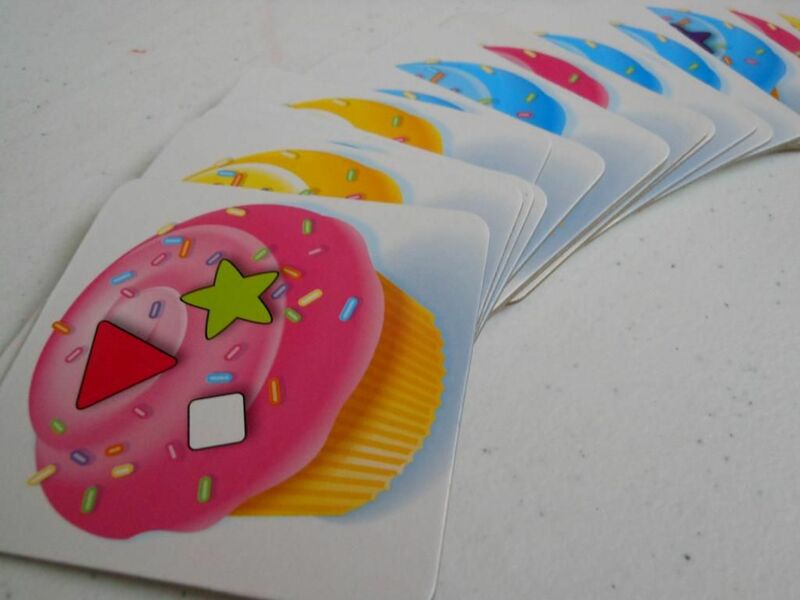 The cards show cupcakes with a variety of different coloured "sprinkle" shapes on the top. For example, a cake may have a single purple circle, or it may have a white cube, a green triangle, and a pink circle. There are 16 cupcakes in total, with four in play at any one time. On his or her turn, a player rolls a dice. This results in a number between one and three, representing the number of times the player gets to shake a plastic cupcake filled with wooden shapes of different colours. The cute plastic cupcake and "sprinkles." Shaking the cupcake causes some shapes to fall out, and the player then matches those shapes with shapes depicted on the cards. If a player manages to complete one or more cards, the player takes those cards, and replaces them with new cards from the deck. Once all the cupcakes have been decorated, players add up how many cakes they have to determine the winner. In the case of a tie, players add up the "sprinkles" on their cakes to determine who is the winner. Like I said, it is a very simple game. But for young children, it is absolutely perfect. Shaking the shape dispenser is pleasantly tactile, and the children have to count the number of shakes to ensure fair play. Additionally, the pattern and colour recognition element is ideal for children much younger than the four and above age suggested on the box. And then there are the choices. Not many choices, admittedly. But choices. For example, is it better to score two cakes with one shape on each, or one cake with three shapes on it? The higher value cakes are better for the tie breaker, but if you get enough low value cakes, then there won't be any need for a tie breaker. 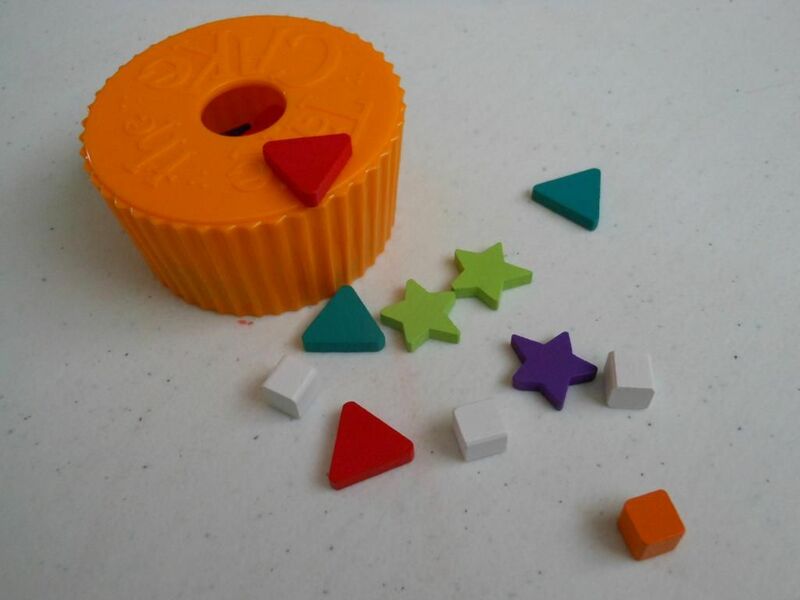 There are also plenty of situations where children have to figure out how to place shapes to make it as difficult as possible for other players to finish the cakes, an element of the game that is even more enjoyable when you consider that certain shapes (cubes) are easier to get out of the plastic cupcake than more complex shapes (stars). There is nothing incredibly deep here, but there is just enough of everything to make it a fun and engaging experience for young gamers. The designer has taken something as big and impossible as modern games, and created something that children can relate to. And adults too, I guess. 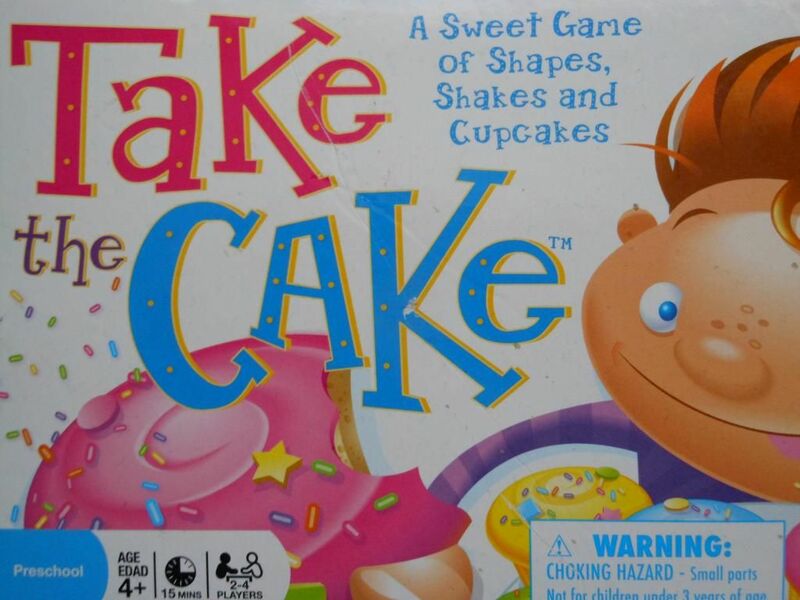 Of course, adult gamers are never going to play this without children; but I have played Take the Cake for hours with my daughter. One day, she will be too grown up to play it anymore, and we will relegate it to the "bye bye" box. But we will always have those happy times to remember.